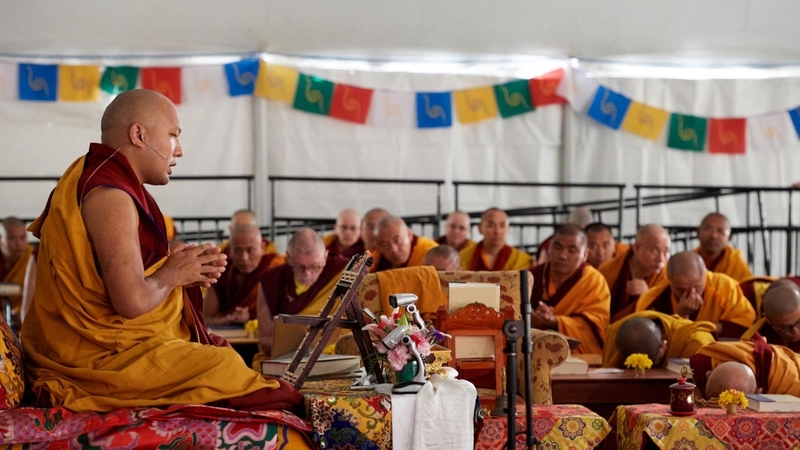 On this third day of the North American Kagyu Monlam, His Holiness continued to explain the Three Principal Aspects of the Path. Having finished the first of the three, the desire for liberation, he had started the second, the generation of mahayana bodhichitta, which has two parts: the reason for doing so and the means by which is it generated. Yesterday he had completed the first part and today he turned to the second. As I mentioned yesterday, in order to generate precious bodhichitta, we must have the (1) altruistic commitment to benefit others. This depends on having both the (2) compassion that seeks to remove the suffering of others along with all its causes and (3) the love that wishes for them to have happiness and all its causes. These three are indispensable; however, among them, the actual motivating force is the altruistic commitment to benefit others while the other two are its branches. “Initially, however, compassion that wishes to remove others’ suffering, is more important, and could be considered the root of bodhichitta. We can speak of three types of compassion. The first are the thoughts about it that pass through our brain as we think about compassion, whether or not we have a strong feeling about it. The second type arises when we see, for example, the photograph of a car accident and we have a strong emotional reaction. This might feel like compassion, but when we look more deeply into it, we can see that this reaction is actually based on fear and our wish not to experience something similar. The third type is a profound compassion that we have consciously cultivated through practice; it is not a temporary reaction like the first two, but come from analyzing the nature of suffering and resolving to do something about it. This kind of deep and stable compassion gives us great courage. “The great compassion taught in Buddhism is not merely an emotional response tinged with sadness or fear that comes and goes in response to a temporary situation. It is not superficial in this way but deep and, therefore, stable as well. This profound stability is due to our compassion being based on wisdom and reasoning. This compassion is not mere empathy or sympathy, not some kind of concern or affection. It is not saying, ‘I know what you’re going through.’ Or ‘I get your situation.’ It is also not coming from someone high up to someone low down. Actually, it is not the case that the person feeling compassion is in a good place and the other is down on their luck, so the one better off is bestowing their compassionate action on the unfortunate person down there. “Actually, true compassion makes little distinction between self and other. We naturally feel that we are a part of others and they are a part of us. We can feel their suffering one hundred percent or at least, really know a good deal of what it is like, and so we are able to take on all or most of their burden. This is the capacity we need to develop. It means that we feel little or no gap between ourselves and others; apprehending a self and an other is weak or nonexistent, for the sense of separation into two has faded away. “Scientists say that all human beings are born with an innate capacity for empathy but over time, it grows dull if the surrounding environment does not allow it to develop. Some say that this is the case with politicians, especially the successful ones, because to influence people and win votes, they focus on selling themselves. To the extent that they do this, so much less are they concerned with others. Their ambition can inhibit their empathy. “To allow our empathy to develop, we need to train to the point that the power of our compassion is so strong that it arises naturally without having to think. For this to happen, we need to train again and again. One way we can remind ourselves and others of compassion is to frequently use kind and affectionate words. This is especially important in the case of young children. Just hearing loving words will place a positive habit in their minds and their compassion will grow. In sum, we need to study and train so that the compassion we are born with will flourish. 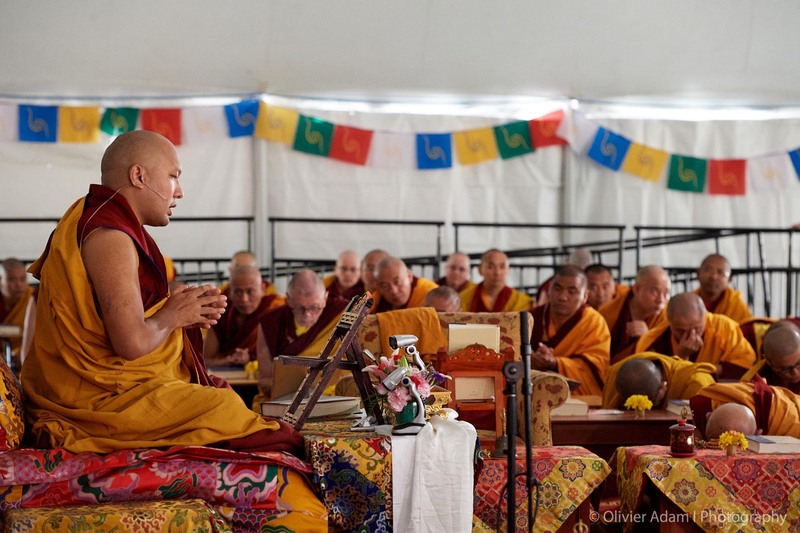 “To cultivate compassion, we need to understand the suffering others are going through. As I mentioned before, this knowing is not based on seeing a photo of some disaster like a car accident or someone emaciated by famine or laid low by a serious illness. We are not merely influenced by external images, but have examined and reflected intensely about the nature of suffering and know its many aspects as well. This is explained in the following two stanzas. They are immersed in the thick darkness of ignorance. To painfully experience without cease all three sufferings. We give rise to supreme bodhichitta. “‘Thinking that our mothers are caught in such misery belongs to the first stage of developing love and compassion. When we are encouraged to expand our love, it does not mean that love is absent, but that the love we feel is not impartial; it is biased or inclined toward those with whom we have a connection, the members of our family, our friends, and so forth. This is a narrow love based on attachment to our relationship with them and not the great love and compassion we are ultimately seeking. Actually, our love should extend beyond people who are close to us and reach out to those with whom we have no obvious connection. From this stage, we move into feeling love even for those who have harmed us or whom we consider our enemies. We move beyond any bias and beyond relating only to friends but not enemies. Great compassion happens when we are able to love all living beings. “Therefore, compassion, as it is meant here, is based on reason and not emotional in the sense of being based on attachment and aversion. The limited scope of the compassion we feel for those we are close to is the same compassion that we come to feel for those we do not know, for everyone wishes to be free of suffering. Since we are in samsara, there is not one being who does not suffer from our pets up to those we consider our enemies, who harm us only because they are suffering. So comprehending the reason that all beings desire to be released from their misery, we can give rise to compassion for them. Even those who have harmed us will then become objects of our compassion; we should not wish that they be unhappy and suffer, because all have the basic human right to be free of suffering and know happiness. This we cannot ignore. “When we are meditating on a yidam deity, they are usually sitting (or less commonly) standing on a lotus and a full moon disk. At this time, it is important to understand all the aspects of the visualization. Here in the context of generating relative bodhichitta, the lotus represents compassion and the moon disk, relative bodhichitta. We imagine a full moon because we want to develop an all-embracing, entirely altruistic love, compassion, and bodhichitta, which is represented here by the full moon. Normally, we do have these three, but they are incomplete and more like the crescent moon. The full moon represents great compassion that is so rich and complete that it transcends any preference and extends to all living beings equally. Our giving rise to bodhichitta needs to be like this. Just as the full moon rises in the open space of the sky spreading its light everywhere, in the same way the light of our compassion reaches all living beings. If we can use our imagination like this, we will come to actually experience this feeling. “When we are doing yidam deity practice, we need to know the meaning of the different parts of the visualization. If we do not know this and just try to maintain a clear image of the deity, the practice can become very difficult. People often ask me, ‘What size is the deity?’ and it is difficult to answer as the size of the deity can vary. Likewise, the many aspects of the deity’s appearance can be troublesome if we do not know what they mean. For example, Chenrezik’s four arms represent the Four Immeasurables. If we could put our full heart and energy into the visualization, we could even meditate on the 1000-armed, 1000-eyed Chenrezik, a form that represents his all-encompassing, irrepressible, and intense compassion for every living being. “In the verses above, showing how to cultivate compassion, the first line states, ‘They are carried away by the raging current of the four rivers.’ Here the rivers could be said to represent birth, old age, sickness, and death. Like a plunging into raging river, we are carried away by our karma, helpless to do anything about it. At certain points in our lives, we can experience this. For example, we can work very hard to accomplish something but the outcome is not what we had wished for and we are helpless to change it. “The third line of the verse states, ‘They are captured in the iron web of self-fixation.’ This points to the narrow and confining world we have created for ourselves due to our false belief in a so-called self and in what it thinks it possesses or simply put, an “I” and “mine.” We take this self to be an independent entity, but if we examine it carefully, this concept falls apart. The fact is that “I” could not be an independent entity; we could not survive without depending on others. They give us our clothing, food, and the very air we breathe. Nevertheless, through this false belief in an “I,” we imprison ourselves in a cramped and narrow world, just as if we had put ourselves inside an iron net. 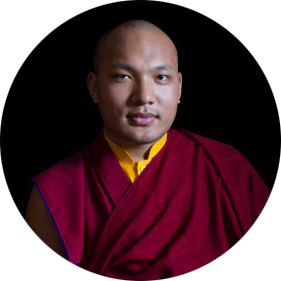 Having finished this second section on generating bodhichitta from the Three Principals of the Path, the Karmapa said he would explain the third section on correct view during the empowerment in the afternoon.